IdeaScale provides its web-based Services to support innovation, facilitate dialogue, and to collect ideas and feedback for use by IdeaScale customers. The information you share with IdeaScale, as either an IdeaScale customer or an end user of an IdeaScale customer, is shared, via the internet, with a limited set of IdeaScale end users or the public at large, depending on the community for which you are registered and the preference of the customer that runs that community. In order to use the Services, you must first complete a registration form and create a username and password. During registration, you are required to give your name and email address. IdeaScale uses this information to contact you about the Services and to provide service-related notices as described in Section 3 below. These communications are used to give you a better understanding of the Services and to support your use of the Services. As always, you have the option not to receive these communications (see Section 5 below). Additionally, an IdeaScale customer may upload email addresses to the Services for the purpose of inviting the address owners to customer's IdeaScale community. IdeaScale will never share any email address, regardless of how it was collected, with any third party without the email address owner's explicit consent. If you purchase a service from IdeaScale, you must provide your contact information (such as name and billing address) and financial information (such as credit card number and expiration date). IdeaScale encrypts all credit card information. IdeaScale will use this information to contact you if there are any issues while processing the order. IdeaScale will also use this information to send you service-related communications as described in Section 3 below. These communications include email confirmations of billing transactions, account upgrades, and account cancellations. IdeaScale stores information that it collects through user input, cookies, log files, and user forms to create a user profile. Depending on your specific use of the Services, a profile may include the following: Registration Information - depending on how IdeaScale customers decide to use the Services, this may include, for example, any of the following: username, password, first name, last name, email address, zip codes, and phone number; and Preferences - profile selections, such as language preference, that determine the specific way you want IdeaScale Services delivered to you. Details from your profile may be used to contact you to provide tailored promotions and marketing offers about IdeaScale Services and to make service improvements (see Section 3 below). You may update your profile information at any time by clicking on your "Profile" link while logged into your account. 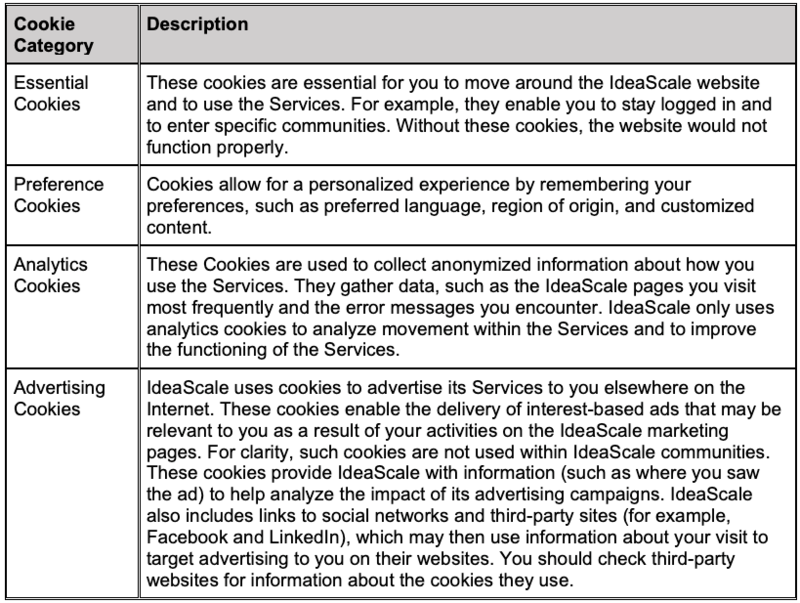 IdeaScale collects information about you and your use of the Services through tracking technologies such as cookies. See Sections 6 and 7 for full details. IdeaScale collects information under the direction of its customers and has no direct relationship with the individuals whose personal data it processes on behalf of its customers. IdeaScale may transfer personal information to companies that help it provide the Services. Transfers to subsequent third parties are covered by the service agreements between IdeaScale and its customers. IdeaScale retains personal data it processes on behalf of its customers for as long as needed to provide the Services to its customers. IdeaScale retains this personal information as necessary to comply with its legal obligations, resolve disputes, and enforce its agreements. IdeaScale occasionally sends its users information on service updates and enhancements, new offerings, and additional instructions on how best to use of the Services. These communications are designed to educate you about the Services. IdeaScale provides you the option not to receive these types of communications; please see Section 5 below for details. IdeaScale sends service-related announcements when it is necessary to do so. For instance, if a service is temporarily suspended for maintenance, IdeaScale may inform you about the suspension with an email. Service-related emails are also sent to confirm billing transactions, account upgrades, and account cancellations. Generally, you may not opt-out of these communications, since they are necessary to provide the Services. If you do not want to receive service-related announcements, you have the option to cancel your account. At the commencement of your use of the Services, IdeaScale will send you an email to verify your username and password. Throughout your use of the Services, IdeaScale account management and/or support may use your contact information to answer your questions, to respond to service requests, and to provide account management services. To Provide Services from Third-Party Service Providers. IdeaScale uses third-party tools to aid its delivery of its Services to you. Such service providers are contractually bound to keep your information confidential and to use your information only as necessary to provide their services. Examples of such providers include administrative tool providers, data centers and chat support hosts. IdeaScale uses outside credit card processing companies to process your credit card payments. These companies do not retain, share, store or use personally identifiable information for any other purposes. To Provide Requested Partner Services. If you specifically request a service from one of IdeaScale’s partnering companies, your personally identifiable information will be shared with the applicable partnering company. After such a request is made, the partnering company may contact you directly regarding your inquiry. Any service offered by a partnering company will be clearly indicated as a partner's service and not IdeaScale's, and any request must be initiated solely by the user. If you voluntarily submit your personally identifiable information when requesting informational materials from IdeaScale, this information will be shared with a third-party marketing automations tool, which IdeaScale uses to automate and target its messages to you. IdeaScale reserves the right to disclose your personally identifiable information as required by law and when it believes that disclosure is necessary to protect its rights and/or to comply with a judicial proceeding, court order, or legal process. This includes required disclosures by IdeaScale of a European Union individual's personal information in response to a lawful request by public authorities, including to meet national security or law enforcement requirements. To Continue Providing Services in the Event of a Merger or Acquisition. If IdeaScale is involved in a merger, acquisition, or sale of all or a portion of its assets, you will be notified via email or a prominent notice within the Services of any change in ownership or uses of your personally identifiable information, as well as any choices you may have regarding your personally identifiable information. To Advertise IdeaScale Services to Visitors of IdeaScale’s Marketing Pages. IdeaScale uses ad targeting cookies, only within its marketing pages, that collect IP addresses to advertise IdeaScale services to such visitors elsewhere on the Internet. See Section 7 to learn how to manage these cookies. If you no longer wish to receive communications about service updates, new offerings, or how best to use the Services, you may opt-out of receiving them by following the instructions that are included in each email. As noted in Section 3 above, if you do not want to receive service-related announcements (announcements that are necessary to provide the Services), your only option is to cancel your account. As is true of most web sites, IdeaScale gathers certain information automatically and stores it in log files. This information may include Internet protocol (IP) addresses, browser type, Internet service provider (ISP), referring/exit pages, operating system, date/time stamp, and/or clickstream data. IdeaScale does not link this automatically collected data to other information collected about you. Technologies such as cookies, beacons, tags and scripts and similar tracking technologies are used by IdeaScale, IdeaScale affiliates, marketing partners, analytics providers and online customer support providers. These technologies are used to analyze trends, to administer the Services, to track activity in the Services, to gather demographic information about the user base, and to create reports regarding use for internal review. To manage cookies, see Section 7 below. For end users within the IdeaScale applications, your publicly available IP address is collected for the purpose determining the appropriate language in which to provide the Services. In non-United States jurisdictions an IP address may be classified as personal information or personal data under applicable laws; therefore, to the extent that IdeaScale collects IP addresses, IdeaScale will collect, use, maintain, secure and/or disclose IP addresses in accordance with applicable Laws. Additionally, and only for visitors to IdeaScale’s marketing pages, IP addresses are collected to advertise IdeaScale services to these visitors elsewhere on the Internet. See Section 7 to learn how to delete and control these cookies. IdeaScale sometimes places small data files called cookies in your browser. This is a common practice for the functionality of many websites. A cookie is a small text file that a website saves on your computer or mobile device when you visit a website. It enables a website to remember your actions and preferences (such as the fact that you logged in, your preferred language and font size, and other display preferences) over a period of time, so you don’t have to re-enter such details each time you return to the website. Cookies can either be session cookies or persistent cookies. A session cookie expires automatically when you close your browser. A persistent cookie will remain until it expires or you delete your cookies. Expiration dates are set in the cookies themselves; some may expire after a few minutes while others may expire after multiple years. Where does IdeaScale use these cookies? Cookies are used on its marketing pages and within its Services. IdeaScale may place cookies on your computer or device, and receive information stored in cookies when visiting or using the Services. IdeaScale uses various domains to set cookies, including ideascale.com, its subdomains, and the domains used by IdeaScale communities. How to delete and control cookies. If you do not want cookies or certain types of cookies to be placed in your browser, you can change your browser’s settings to delete cookies that have already been set and to not accept new cookies. To learn more about how to do this, visit the help pages of your browser. Please note, however, that if you delete cookies or do not accept them, you might not be able to use all of the features offered by the Services and may have to manually adjust some preferences every time you visit. If you wish to not have cookies used for the purpose of serving you interest-based ads, you may opt-out by clicking here (or if located in the European Union click here). Upon request, IdeaScale will provide you with information about whether it holds, or processes on behalf of a third party, any of your personal information. To request this information please contact IdeaScale at support@ideascale.com or the postal address listed below. IdeaScale collects information under the direction of its customers and has no direct relationship with the individuals whose personal data it processes on behalf of its customers. IdeaScale acknowledges that you have the right to access your personal information. If you seek to access your personal information, or seek to correct, amend, or delete inaccurate data and are unable to do so by logging into your account, please contact the IdeaScale customer with which your account is associated for assistance. Customers may correct, amend, or delete inaccurate personal information through their administrator panels. If a customer requests IdeaScale’s assistance to remove data, IdeaScale will respond within a reasonable timeframe. IdeaScale will retain your information for as long as your account is active and as necessary to comply with legal obligations, resolve disputes, and enforce agreements. The security of your personally identifiable information is important to IdeaScale. When you enter information such as credit card number on an order forms, IdeaScale encrypts that information using secure socket layer technology (SSL). IdeaScale follows generally accepted industry standards to protect the personally identifiable information submitted to it, both during transmission and once it is received. No method of transmission over the Internet, or method of electronic storage, is 100% secure; while IdeaScale strives to use commercially acceptable means to protect your personally identifiable information, IdeaScale cannot guarantee its absolute security. IdeaScale offers publicly accessible blogs, community forums and IdeaScale communities. You should be aware that any information you provide in these areas may be read, collected, and used by others who access them, and could be used to send you unsolicited messages. IdeaScale is not responsible for the personally identifiable information you choose to submit in these forums. To request removal of your personally identifiable information from an IdeaScale blog or community forum, contact IdeaScale at support@ideascale.com. In some cases, IdeaScale may not be able to remove your personally identifiable information, in which case it will let you know if is unable to do so and why. IdeaScale displays personal testimonials of satisfied customers on its site in addition to other endorsements. With your consent IdeaScale may post your testimonial along with your name. If you wish to update or delete your testimonial, you can contact IdeaScale at support@ideascale.com. You can log into the Services using sign-in services such as the social media login features provided by sites such as Facebook and LinkedIn. These services will authenticate your identity and provide you the option to share certain personal information with IdeaScale, such as your name and email address, to pre-populate your sign up form and profile. Social media login gives you the option to post information about your activities on the Services to your profile page to share with others in your network. This Section 16 only applies to personal information from European Union member countries and Switzerland. IdeaScale participates in and has certified its compliance with the EU-U.S. Privacy Shield Framework and the Swiss-U.S. Privacy Shield Framework. IdeaScale is committed to subjecting all personal data received from European Union (EU) member countries and Switzerland, in reliance on each Privacy Shield Framework, to the Frameworks’ applicable Principles. To learn more about the Privacy Shield Frameworks, and to view IdeaScale’s certification, visit the U.S. Department of Commerce's Privacy Shield List . IdeaScale is responsible for the processing of personal data it receives under each Privacy Shield Framework and subsequently transfers to a third party acting as an agent on its behalf. IdeaScale complies with the Privacy Shield Principles for all onward transfers of personal data from the EU and Switzerland, including the onward transfer liability provisions. IdeaScale shall remain liable under the Principles if its agent processes such personal information in a manner inconsistent with the Principles, unless IdeaScale proves that it is not responsible for the event giving rise to the damage. With respect to personal data received or transferred pursuant to the Privacy Shield Frameworks, IdeaScale is subject to the regulatory enforcement powers of the U.S. Federal Trade Commission. In certain situations, IdeaScale may be required to disclose personal data in response to lawful requests by public authorities, including to meet national security or law enforcement requirements. Under certain conditions, more fully described on the Privacy Shield website [How to submit a complaint], you may invoke binding arbitration when other dispute resolution procedures have been exhausted. IdeaScale reserves the right to modify this policy at any time, so please review it frequently. If a material change is made, IdeaScale will notify you by email, or by means of a notice within the Services prior to the change becoming effective. Effective as of March 6, 2019.